Michel Martin: Alice in Wonderland or where did I leave my hat? You don’t go to see a Hollywood film expecting a meaningful experience. It won’t happen. It is your duty to predict disappointment, embrace it and begin the viewing process from that point onwards. Isn’t it rather dull to spend at least half an hour criticizing a piece of work which was never intended to identify with what you call…quality? Acknowledge the boundaries set by consumerism and move on. Enjoy the bits. Play with the freedom of interpretation; personalize the time you invest in the process. So, I went to see Alice in Wonderland, avoiding carefully preconceived ideas which could not possibly help as I was decided to see it anyway. 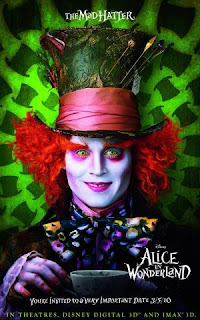 I loved the Mad Hatter/ Johnny Depp. I loved them both, 2 in 1. The acting, the looks… I mean, who doesn’t love red haired creatures with mad green eyes? Especially when they’re hat designers, serve tea, have rabbits and mice as friends and they wear beautifully tailored costumes in hypnotic colours; not to mention the purple/ pink lipstick and the oddly way he speaks English, like a vintage horrific puppet. I wanted to gift-wrap him and take him home. I am not going to talk about the plot, as you already guessed, it is not worth it. Mainly because I don’t care about the Alice part, I care about the Wonderland part. We all know the ancient battle between Good and Evil. It’s all the same thing, over and over again, dressed up differently. I particularly enjoyed Alice’s body size alternation; it was kind of revelatory if you’ve got enough innocence in yourself to trace back childhood memories when the table was way above you. (It reminded me of the Table and Four Chairs, the sculpture by Robert Therrien that I've seen last week at Tate Modern). Well, it was delightfully suggestive and thought-provoking in terms of proportion shifts. How does it feel to be trapped in a tea pot? 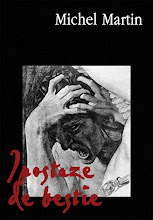 I did take this film as a surrealist treat, although it is far from being a surrealist work. I engaged myself in the potency of dream-world and I allowed myself to imagine how a surrealist painter would have chopped off the raw material offered by the Hollywood producers. There’s nothing wrong with non-art in art, as long as it supplies some kind of foundation for further investigation. And I am really keen on purchasing a good old version of Alice in Wonderland, the book. I might dig up some second hand book stores on Charing Cross Road. P.S. Alice in Wonderland has broken the UK box office record in his first weekend of release scoring £10 million, the highest debut for a 3D film surpassing Avatar's £8.5 million from last year. exista ceva in spiritul englezesc care se numeste pasiunea pentru gothic , mister si poveste . de-aia le-a placut alice in wonderland . de-aia le-a placut the imaginarium of doctor parnassus . vazut . interes pentru culori . marionete mecanice . burton schimba al naibii petrecerea cu ceaiul . de vazut secventa din cartea lui lewis . Da, asa este. Arhitectura, gradinile, vremea... totul invita la tricky storytelling. Culorile. Nici nu pot incepe sa vorbesc despre culori. Spun doar ca nu-mi mai pot lua ochii de pe fotografia-afis a Mad Hatter-ului. Este o capodopera in makeup artistry. Scena petrecerii cu ceaiul este schimbata pe buna dreptate, intrucat Alice se re-intoarce in Wonderland. Imi place senzatia de atemporalitate creata de Burton acolo. Dust and decay.